Raw audio data in general is large and undesired. Godot provides two main options to import your audio data: WAV and OGG Vorbis. Each has different advantages. * Wav files use raw data or light compression, make few demands on the CPU to play back (hundreds of simultaneous voices in this format are fine), but take up significant space. * Ogg Vorbis files use a stronger compression that results in much smaller file size, but require significantly more processing power to play back. Here is a comparative chart. Consider using WAV for short and repetitive sound effects, and OGG for music, speech, and long sound effects. Godot 3+ has an amazing bus system with built-in effects. This saves SFX artists the need to add reverb to the sound effects, reducing their size greatly and ensuring correct trimming. 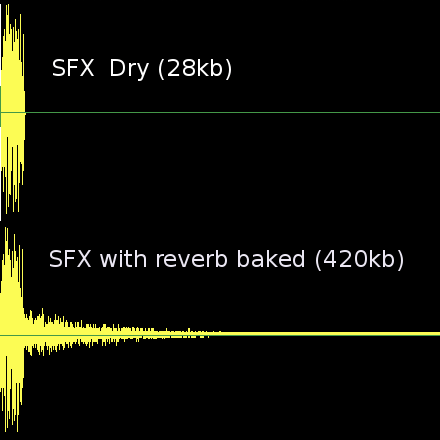 Say no to SFX with baked reverb! As you can see above, sound effects become huge with reverb added. One issue that happens often is that the waveform is exported with long silences at the beginning and at the end. These are inserted by DAWs when saving to a waveform, increase their size unnecessarily and add latency to the moment they are played back. Importing as WAV with the Trimming option enabled solves this. Godot supports looping in the samples (tools such as Sound Forge or Audition can add loop points to wav files). This is useful for sound effects, such as engines, machine guns etc. Ping-pong looping is also supported. As an alternative, the import screen has a “loop” option that enables looping for the entire sample when importing.